iPad mini 5 + Apple Pencil is the digital field notes with online sync of my dreams. Apple created iPad, then iPad mini. Then Apple destroyed iPad and created iPad Air, only to destroy iPad Air and create iPad Pro. Twice. Thrice. Fice? Whatever. Now, Apple has recreated iPad and, finally, iPad mini and iPad Air as well. So, what we have now, for the first time, is a fairly complete lineup of iPads, from entry level to mid-range to top end. And that's thanks, in large part, to the new iPad mini 5 and iPad Air 3. I got to spend some time with both in New York City, and while I only managed to abscond with the new mini, and have spent roughly 72-hours with it so far, the new Air is almost identical. Since I spent the better part of a year with the old 10.5-inch as my primary iPad, and I realize a lot of you want all the information possible to make the best buying decision possible, I'm going to offer up some preliminary thoughts on it as well. In other words, twice the review bang for your read. Rather watch than read? Just hit play on the video above! The iPad mini 5 is exactly the same size as the mini 4. That's 7.9-inches on the diagonal for the display. The iPad Air 3 is bigger than the Air 2, though. It doesn't quite go to 11 like the 2018 Pro, but it gets pretty close: 10.5-inches, just like the 2017 Pro. That might make it ever so slightly less portable but, as Apple said a couple of years ago when they debuted the 10.5-inch size, it's just perfect for the on-screen and external keyboard. Sticking with a 7.9-inch model in the age of iPhone XS Max might seem strange. Big phones overlapping with small tablets, and all. But the aspect ratio actually makes a difference. Phones are big now, but skinny and tall. That means documents are constrained by the width, not height. And that makes them small. iPad mini, at 4:3 instead of 19.5:9, doesn't have that problem. It's not only still almost twice as large as the Max, pages fit on it much better as well, resulting in not just a bigger but better experience. Sure, if you don't want to have to buy or carry both a phone or tablet, the Max is a great mix. But if you do want a small tablet, it definitely still has some advantages even over a big phone. Since the mini 5 is identical in size to the mini 4, and the Air 3 to the 10.5-inch Pro, most cases and accessories should be compatible. There are some minor differences in camera cutouts, and the button and speaker placements, that could make some a little sloppy around the edges, though. So, test before committing. Stating the wicked obvious, the design language of these new iPads is decidedly old. Or, I guess, classic, if you prefer. Yeah, neither the new mini nor the new Air do anything to continue the war on bezels. Instead, both retain Touch ID, the second, faster generation sensor, and the bezels to go with it. Yup, Apple is saving the new design language for the high end, at least for now. Same with the speakers. The Pros have four that adjust the sound with the iPad orientation. The mini 5 and Air 3 stick to two… which rotate the sound with the iPad. That's nowhere nearly as good, especially in landscape, but it's part of what's keeping the sticker price non-Pro as well. And, yeah, they have Lightning instead of USB-C. For some people, especially those with tons of Lightning accessories already, that's probably a benefit. For nerds like me who just want to plug everything into the same port, not so much. But, it's obviously yet another point Apple's using for differentiation. In other words, if you want that more computer-like connector, so you can hook up external displays and all your other toys, you'll still have to go Pro. That also means both also have a 3.5mm headphone jack, with is something the fancy new Pros with their narrower bezels don't anymore. I've got AirPods. I'm fine. But for people who prefer old school headphones, or need to be able to listen and charge at the same time for accessibility, these might be even better. Then there's the silver, space gray, and Apple's current-coppery gold options, the latter of which Apple won't give the Pros anymore either, not at any size, I guess out of risk of distracting us with all that shiny, shiny wonder? As someone who loves the colors and wishes we'd see even more of them, like Product RED more of them, that's a plus. 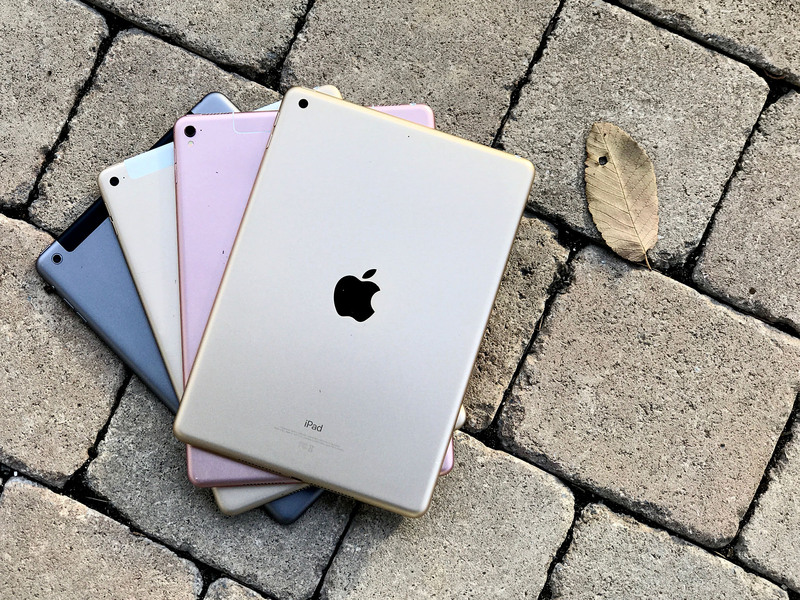 Both the iPad mini 5 and iPad Air 3 have laminated displays, just like the iPad mini 4 and iPad Air 2, and a considerable step up from the currently non-laminated 9.7-inch iPad nothing. Especially when combined with its anti-glare coating for really low reflectivity. It's not something everyone notices all the time but, if you're in bad indoor or bright outdoor lighting, it can really make a difference. They're also DCI-P3 wide gamut color, so your reds look really bright, fire red and your greens are beyond verdant. Making them better than any mini or Air that's come before. Again, not everyone appreciates wide color, but if you're painting on your iPad or working with photos, it looks so good it's hard to go back to plain old sRGB. There's no 120hz ProMotion on either. So, if you're waiting for that buttery fresh refresh rate, you'll have too go Pro or just keep on waiting. But there is True Tone, which dynamically adjusts to display to match the color temperature of the world around you, keeping white-white. Not blue-white or yellow-white but crispy, paper white. I know some people dislike it for photo editing or other, color sensitive work, but I love it and leave it on all the time. On the inside, we have the Apple A12 Bionic system on a chip. It's not quite the SoC of the Pros, which have an even beefier A12X. There you have four efficiency and four performance cores, while here you have but two of the latter, and 4 GPU cores rather than 7 in the X. With, yeah, 3GB of memory. There's no Face ID, of course, not on either, but the neural engine in the A12 can still help power all the artificial intelligence, machine learning, and computer vision Apple and all the apps throw at it. Everything from photo enhancement, to photo sorting, to all the heavy lifting all those crazy CoreML apps do every day. It's pretty much identical to iPhone XS and still a huge bump up from the A10 Fusion found in the 9.7-inch iPad, never mind the A8 or A8X in the old mini 4 or Air 2. For what are ostensibly mid-range tablets, A12 is ridiculously OP — that's over-powered, don't @ me — but the same is true of iPhone XS. That's kind of Apple's thing these days, though: building in enough overhead that your device won't just fly now, but keep flying for 4-5 years, and iOS updates, to come. With the length of time most people keep iPads, or hand them down, that's flat out terrific. You can play the hell out of Fortnite at 60 frames per second. And, for now, well, you can play the hell out of Fortnite at 60 frames per second. Or, you know, whatever the current hot game paying streamers a million bucks a pop is these days. All this with the iPad standard promise of 10-hours of battery life for both. As always, it'll take me a while to do real real world testing. But there's a Pokemon Go community day again this weekend, and that'll help. And yes, you can too Pokemon on iPad. Especially the GPS models, which don't drift maddeningly like the Wi-Fi only. That Wi-Fi is the same as before, up to 866 mbps MIMO. The LTE is new and improved though. No 5G, of course, because, well, literal LOL, there's just no 5G pretty much anywhere yet. It is up to Gigabit LTE, and you already know the sSIM deal. Stick a regular SIM in it at home, if you go for the cellular model, and then sign up with eSim for travel packages whenever you're on the road. The cellular models are more expensive, of course, but I always go for them. Aside from GPS, I use it all the time while traveling, even as a giant, long lasting tether for my Mac. So, to me, it's always been worth it. Where the new iPad mini 5 and iPad Air 3 break down for me are the cameras. I get we're not paying Pro prices, and the cuts have to come from somewhere, but 8 MP f/2.4 and 1080p on the back just feels so five years ago. The A12 image signal processor, which ties into the neural engine for features like Smart HDR, should still help make the older glass be all it can be. But there'll always be a limit to that older glass. I know some bump-haters love it, because it doesn't bump. And the iPad isn't often a primary camera, so it could well be the best cut for the most people. But, I'll take a better camera and a bump any day. 7 MP 1080p up front for FaceTime and iPad Selfies. Which are too a thing. No Animoji or Memoji though. For that, you guessed it, you need the True Depth camera on the Pro. Everything else is tuned for AR the way Apple has been tuning everything else on all their cameras for the last couple of years: Well. Amazingly well, actually. Like a crystal-clear window into a virtual world well. The new mini supports Apple Pencil. The first generation, not the second. Probably because putting a flat inductive charging edge on the side would make it look and cost more like a Pro. Sure, yeah, you're left charging it out the Lightning Port, like an animal. But I love it. The Pencil part, not the like-an-animal part. It's like digital field notes with online sync. Something I've wanted, hell, dreamed about, for years. And, yeah, love it. I get that some people might not enjoy small canvases for art, but even so, everything from taking notes to marking up documents to freehanding productivity apps like Pages and Keynote works a treat. And just the ability to carry it around in your jacket, or, sure, non-skinny hipster jeans back pocket, and just pull it out and start penciling is terrific. For the 10.5-inch, the Pencil story is pretty much the same as the older Pro. Bigger screen, bigger canvas. But there's a new chapter — with the 10.5-inch size comes the 10.5-inch Smart Keyboard. It's the old version, like the Pencil, but, confession, I… kinda still like it better. It's more origami, sure, but the keys end up in, not out, and that just feels less like bubble wrap when folded back. There's no such Smart Keyboard for the mini, which is understandable given how small it would end up being. But… is it weirder that I kind of want to see Apple figure one out anyway? The mini starts at $399 and the Air at $499, which is the classic iPad price going all the way back to the original. And I think both deliver a lot of value for the money. Especially to people who want Pro-like features without the Pro-like price tags. Initially, I thought I wanted an even cheaper entry-level mini, absent laminated display and with an older chipset would have made the whole product line even more accessible. But I also kinda wanted a more expensive, full on mini Pro, with the new design language… and, yeah, a tiny Smart Keyboard. If I could only have one, I'd be hard pressed to pick between them. But, now, turns out I don't have to. Apple picked a middle ground for a new mid-range that makes the most sense. Same with the Air. Both are the new baseline. The new mainstream. The new normal. I'm still sticking with the Pro because I love all the tech it's packed with. But, for most people, I'd absolutely recommend the new mini and Air instead. My mom, who currently has an Air 2, has already asked the family to team up and get her an Air 3 for her birthday. And my sister, who currently has a mini 3, has also already asked for the new mini 5 for her birthday as well. And that's exactly what I mean. If neither lowest price nor highest performance are your primary drivers, these new iPads are everything you want an iPad to be. Judge it not by its size, for A12 is its ally. If you don't just want less expensive but you also want smaller, the iPad mini 5 (2019) delivers almost the full iPad Air experience at a fraction of the size, weight, and price. The iPad Air 3 (2019) may cost the same as the original iPad, but it brings an almost full-on, pro-level feature set with it for that price.